Fifteen years ago, at the age of 41, I did something that forever changed the trajectory of my personal life. No, I did not leave my brilliant, beautiful wife. Nor did I abandon my legal career with the California Department of Justice. 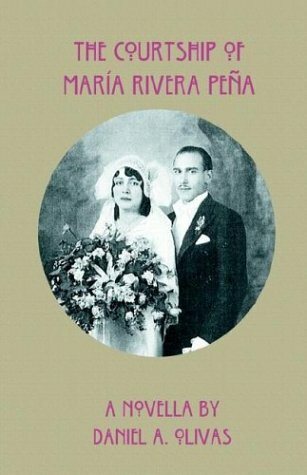 Fifteen years ago, I published my first book, The Courtship of María Rivera Peña, a novella loosely based on my paternal grandparents' migration from Mexico to Los Angeles in the late 1920s. It garnered a few nice reviews, but didn't sell many copies. And the small Pennsylvania press that published it eventually went under so that the book has now gone out of print. Here it is, 15 years later, and I'm still a government lawyer married to my law school sweetheart. Our son has graduated from college and is a fine, interesting young man. But my first little book put me on a road to something so exciting and emotionally fulfilling that it holds a special place in my heart. That road has taken me to the publication of three short-story collections, a novel, one children's picture book, and a collection of essays and author interviews. My fiction, poetry and creative non-fiction appear in a dozen anthologies, including in two published by the venerable W. W. Norton & Co. I've also become a recognized book critic for several publications including the El Paso Times, the Los Angeles Review of Books, and a nationally-recognized blog on Latino literature, La Bloga. My books have been studied by undergraduate and graduate students across the country at such institutions as Ohio State University, San Diego State University, the University of Wyoming, and the University of California at Irvine, to name a few. Scholars cite to my fiction and interviews in books on Latino literature. I've edited a landmark anthology of Latino fiction, Latinos in Lotusland, and my first poetry collection and another short-story collection are making the rounds with publishers. In short, my second act has cast me as a writer. On many levels, this second act has come along with a bit of irony. When I majored in English at Stanford University (back when my hair was long and we danced to the Bee Gees), I had no intention of doing something as risky as "becoming a writer." In fact, I purposely avoided taking any creative writing classes because I thought that it would be a frivolous thing to do. So, I went to law school, spent a few years in private practice, and then in 1990, I was hired into the Public Rights Division of the California Department of Justice. I've been there ever since. But I always loved writing. As a law student at UCLA, I edited the Chicano Law Review and published a piece on an important immigration court decision. As an attorney, I've written many articles for the Los Angeles Daily Journal on such subjects as civil procedure, law and motion practice, and environmental enforcement. And, of course, every day at work, I write briefs, legal memoranda, and letters to opposing counsel. The written word filled my world. Then, in late 1998, I started that first little book, a novella based on family history. I wrote about the great joys and sadness in life and explored what the immigrant experience must have felt like for people such as my grandparents who came to California from Mexico almost a hundred years ago. When I completed the novella in 1999 and sold it to a little press in Pennsylvania, the creative writing floodgates opened. I couldn't stop writing fiction. As my short stories started getting published in literary journals, I began to dabble in poetry, and then book reviews. I'm certainly not the first attorney to write fiction. We all know about Scott Turow and John Grisham. But there are also Latino and Latina lawyers who have made their mark as writers such as Michael Nava, Yxta Maya Murray, and Nicolás Vaca, to name but a few who live and write in California. These attorneys all have excelled in the legal profession yet they also have been recognized for their evocative and often provocative books that explore the Latino experience from decidedly different angles. My "other life" has led me to experiences that have been markedly different from my life as a lawyer. I've read fiction and poetry at high schools, colleges, bookstores and scholarly conferences. This has introduced me to lovers of literature, which by itself, would be enough to validate my second act. But I've also had high school and college students, many of whom are Latino, come up to me after readings and tell me that they want to write. These bright, eager young people see my second act as something they want to do as their first act. My response is always the same: If you want to become a writer, stay in school and read, read, read. I don't regret waiting until middle age to become a writer. In many ways, I think my fiction and poetry are deeper and richer because I've lived more than a few years as a husband, father and (yes) lawyer. And I admit that my second act has been a surprise to me, my family and my friends. But I've learned that life can be surprising. Who knows. Maybe there's a third act in my future.